← Send me your sukkah pics!!! Today was another amazing day! We waited with great anticipation the arrival of David and Deborah Harding of Australia along with special guest, Bulkunu, of the Aboriginal people. They showed up here looking exhausted, even a bit shell-shocked, after a 30 hour trip that started on the other side of the world. 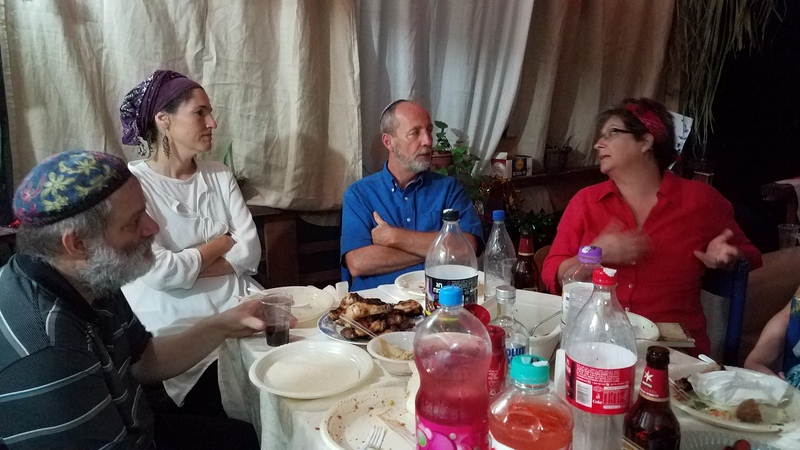 Once we had them safely in-hand with food and a hot shower set up, the ten of us set out on trip to the Golan for an afternoon of feasting and sitting in the sukkah of online friend and writer, Eliyahu Berkowitz. Over the last six or seven months, The Barking Fox and I have come to be good friends with Eliyahu, feature writer for Breaking Israel News. Well, with us coming to Israel for Sukkot, we had to try to get together and today was the appointed time. Eliyahu extended an invitation for us to come sit in his sukkah, shake lulav and share a meal with he and his precious family. For weeks we have been looking forward to this day and it was wonderful! Our journey, that should have taken about two and a half hours, took nearly four hours! Traffic snarls were the major problem, though a wrong turn in Tiberias and a wild jaunt through several parts of town was interesting. But, and interesting thing happened in route… We stopped for lunch at a jamb packed roadside filling station/ restaurant. 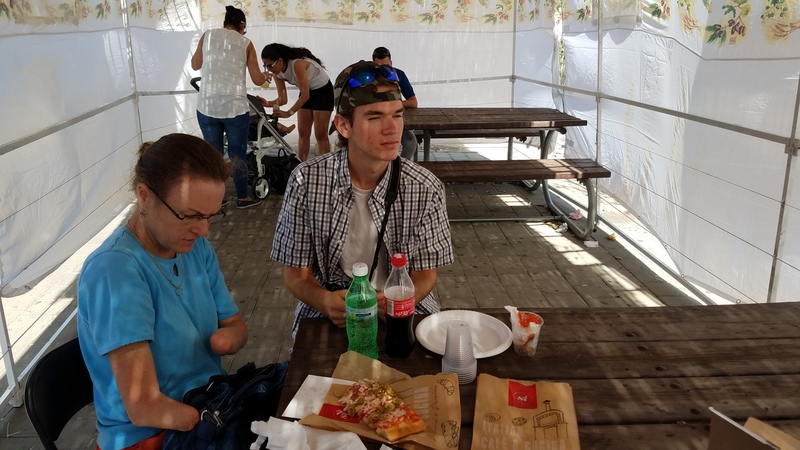 After we had our pizza, but before we could sit down, Tommy was invited by a very traditional looking Orthodox Jewish to come sit in his sukkah for lunch. So, we all paraded the length of this rest stop to a very large sukkah with picnic tables that was very full. After wedging in, we ate and exchanged smiles as well as, ‘Chag Same’ach’s with the many occupants. The variety was very broad from clearly secular Jews to some very Orthodox wearing peyotes and long black coats. 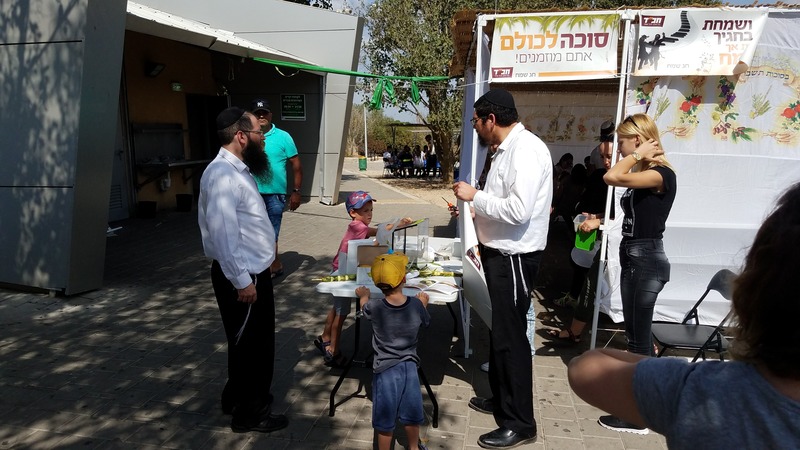 I noticed a tzedakah box and the two gentlemen running the show and understood that they were Chabad.co.il and were helping give everyone an opportunity to shake the lulav in simple obedience to one of those ‘perpetual in all your generations’ commandments. I admired and appreciated their zeal and concern for others that would motivate them to do this work. After more driving, we finally arrived at Eliyahu’s home and I was greeted with a huge hug. 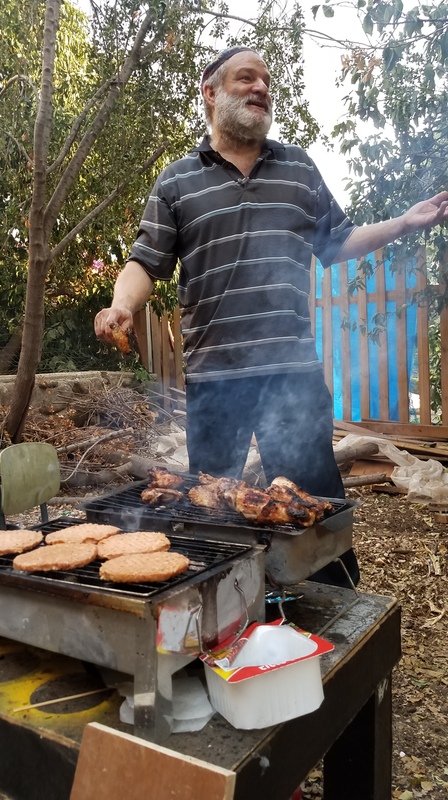 Immediately, we were escorted through the house to the sukkah and backyard as he prepared the grill. I was salivating at the conversation, but even moreso when I found out our friend, in addition to his writing skills, is a trained chef. 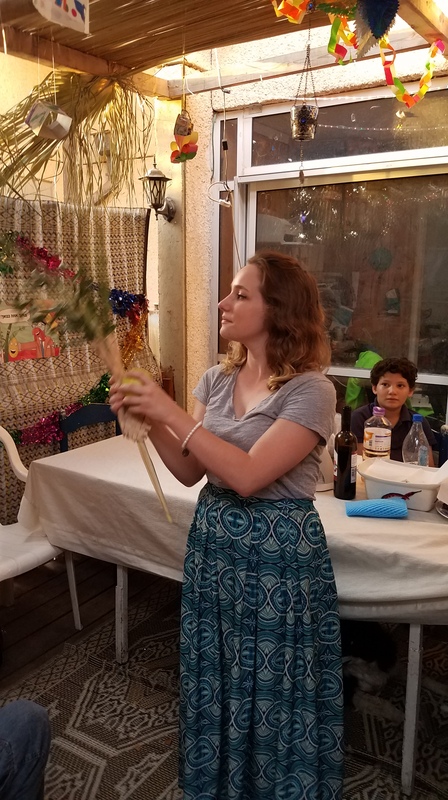 Before the sun set, we each shook the lulav, according to the commandment. Eliyahu’s lovely wife, Devorah, and four children helped to make it a special time together. The food was wonderful!! Such attentive hosts. What unfolded before us was an incredible evening of fellowship. We shared laughter, tears and I watched hearts being knit together. It will be some time before I can process all of the things we discussed, but I can tell you, it was a no-holds barred discussion wherein we shared many things from the heart. It was fascinating to partake of this very special, even holy, ground upon which I could embrace my brother and we could speak to each other with respect as equals. Honestly, I have been overwhelmed at the blessings of my King. If we had only had the precious encounter with the Cohen in the Toronto airport inviting us to the Kotel for the blessing, Dayenu. If we had only danced with Tzemach and Natan and their families, Dayenu. If we had only sat in Aharon’s sukkah on the first night to welcome in Sukkot with the Kiddish, Dayenu. If we had only been invited by strangers into their sukkah on the roadside, Dayenu. If we had only been able to eat with the Berkowitzs, Dayenu. I can’t wait to see what tomorrow brings! Heading to the Old City… time to get some sleep…. This entry was posted in Holidays v. Feasts, Travel and tagged bbq, food, Jerusalem, lulav, Sukkot, travel. Bookmark the permalink. 9 Responses to Dayenu, at Sukkot?? Dear Pete, your sharing of your travels is a blessing & a delight. What wonderful ambassadors you have been for Abba’s namesake. Your pictures are wonderful…I can almost taste the food from the memories I have from our two trips to the land! May you will continue to shine & scatter joy where ever your feet may trod! I cannot express how full my heart is right now…can barely type through the rears welling up in my eyes! Baruch Hashem!! It is so wonderful when you are in the land and feel full. As you say, Dayenu. Finally, I know why the internet was created. So that I could find brothers and sisters I never would have met otherwise. Pete said it perfectly, and it was such an enormous experience that saying it was not an easy thing. My sukkah was filled with love and light. And being Eliyahu, I cried my eyes out. Rebbe Nachman says tears create rivers that protect light, stop the dark side from stealing any of it. But Pete, your wife taught me how to wave a lulav in the holiest possible way. I will never be able to wave lulav again without thinking of how she performed that simple mitzvah and the world shook. Rebbe Nachman says nothing is as whole as a broken heart. And I may be wrong, but when a group of people sit down in a sukkah together and connect on a soul level, that religion thing is not an issue. We love God, and we love each other. Nuf said. Thank you so much for inviting and hosting us. Truly a wonderful soul connecting evening. Thank you for extending your hand!